Flag sleeves are stitched to the printed flag material and are made from an elasticated material. 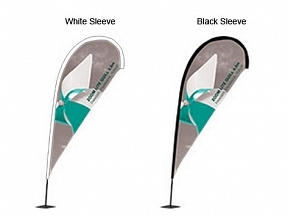 The elasticated material is the part that you feed the pole through and being elasticated it keeps your flag display in the best possible condition. Two colours are available for the sleeve, black or white, we advise you pick the best option to go with your artwork.